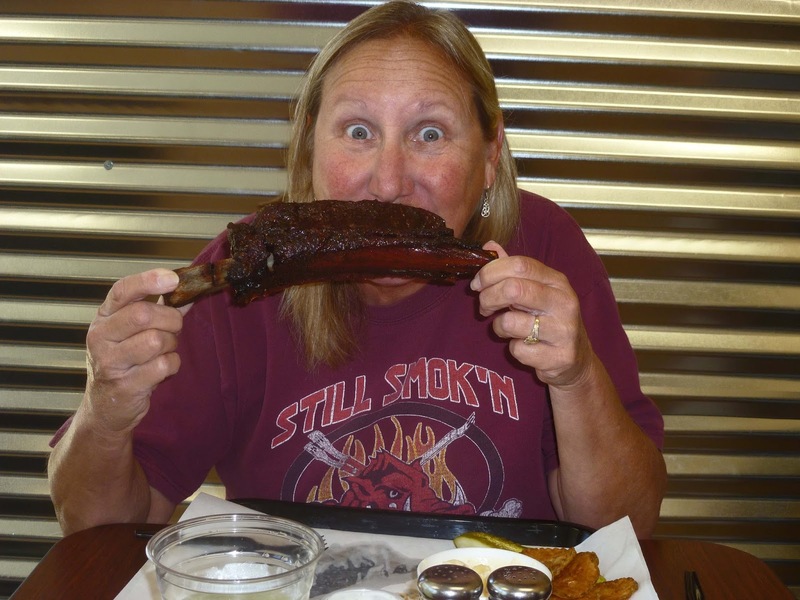 The ‘Racing Honda’ is speeding to the sleepy town of Martinez, California to dine at the newly opened ‘Smokehouse 10’. This should be an interesting and fun meal because Dave Tendick is the owner/pitmaster. 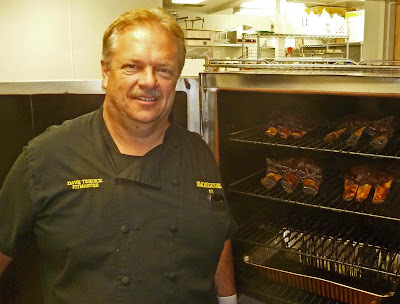 Dave is a competition cooker, caterer, bbq instructor, and television celebrity. 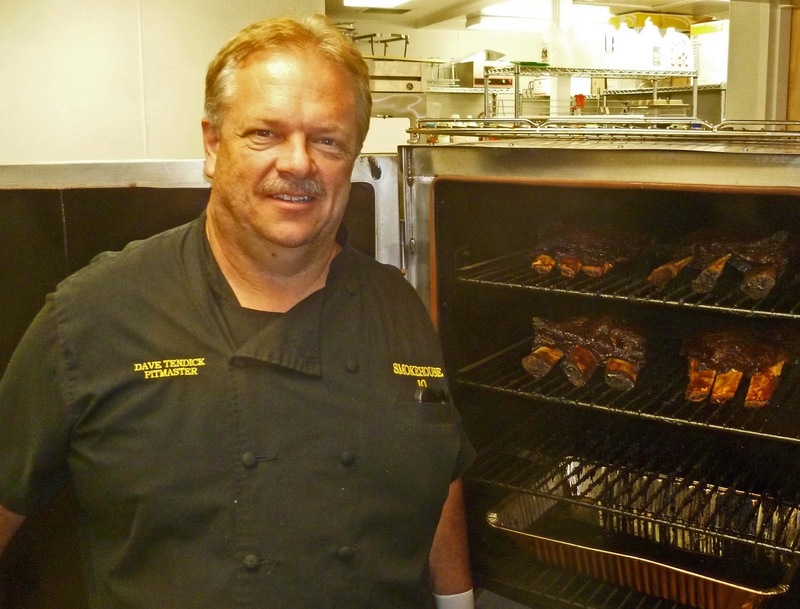 He was a competitor on the television show; ‘BBQ Pitmasters’. Smokehouse 10 is located in Martinez which houses the county courthouse. The downtown scene is hustling and vibrant during courthouse hours but when the sun sets the town becomes a little lonely. This provides a unique challenge for Dave. Smokehouse 10 is located off ‘Main St’ on Pine Street. It is not really hard to find but your GPS will be helpful. The restaurant is located in a small strip of several businesses. Look for the cutout pig sign to know you have arrived. We enter Smokehouse 10 to a very small dinning area and take-out counter. Four tables and a counter make for a cozy eating environment. 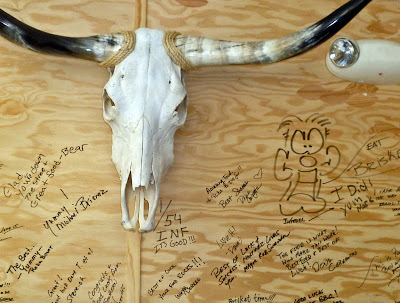 The walls are adorned with ‘graffiti like’ well wishes from customers. There is a chalkboard with the menu and daily specials. We sampled Dave’s menu over several visits. It is always fun to come and talk BBQ with Dave while sampling his smoked meat treats. Thursday’s is beef rib day. You should see the size of this ‘Fred Flinstone’ size rib. It is not only huge and mammoth it is a thing of beauty. I almost shed a tear it was so pretty. 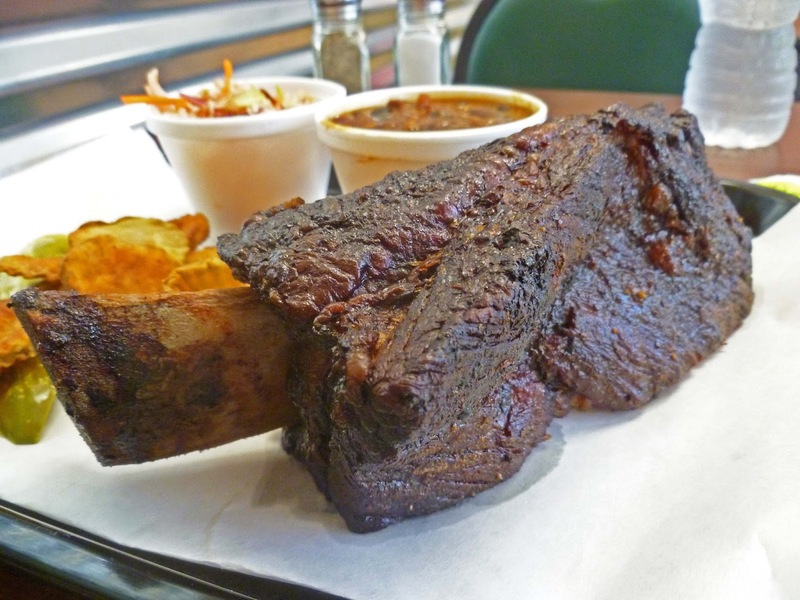 It is an art to smoke and transform a beef rib to a tender and flavorful meal. The dry rub did its seasoning job to perfection. The smoke permeated this rib but did not overpower. When I finishsed, I licked the bone clean Ms. Goofy took half of hers home. Beef ribs were a great beginning to sample this menu. 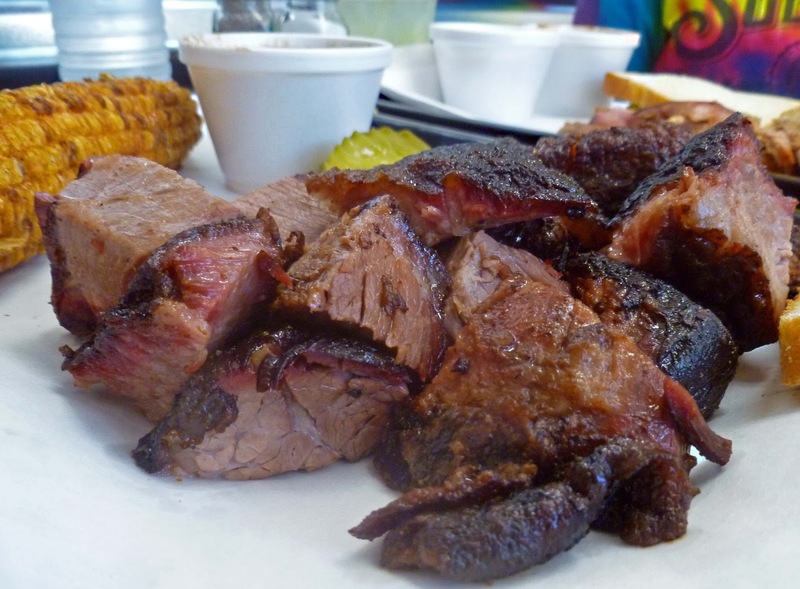 “Burnt ends, Oh how I Love thee” The key to my culinary heart can be won with good burnt ends. This is the cubed, smoked and seasoned point end of the brisket. Done correctly the pitmaster can transform a fatty tough piece of meat to tender, savory, ‘Meat Candy’. These burnt ends came to the table with no sauce. A sweet tomato based sauce was offered at the table. I alternated dipping and not with each cube of meat heaven. This was rich and satisfying. Dave demonstrated his bbq expertise with this dish. A pulled pork sandwich was a tasty treat. The pork was tender and had little pieces of meat candy bark for burst of pork flavor. The meat was piled high on a hamburger style bun. Vinegar based Cole slaw topped this mountain of pork. I have to admit that I was not a fan of the slaw. The spices that seasoned and the ratio of vinegar just seemed a little off to me. 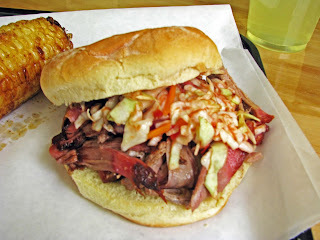 Even though, the pulled pork shined and delivered over the slaw and I did devour the whole sandwich. Side dishes are not just an after thought at Smokehouse 10 .One side dish is deep fried fresh corn on the cob. This sounds like a dish more suited to the midway of the county fair. Once we tried it we were hooked. Some of the kernels had darkened from its trip to the fryer. The corn was tender and had a nutty like flavor from the frying. It was not oily or greasy at all. It had been seasoned with a good amount of salt to enhance flavors. This was a winner. Beans were another delicious side dish. Small black & navy beans kissed with molasses and studded with small chunks of brisket makes a hearty and satisfy side. Ms. Goofy gave the paws up for her creamy, cheesy macaroni and cheese. Dave makes all his side dishes from scratch. The quality shines in these dishes. In so many bbq restaurants side dishes are usually mediocre at best. Our last visit we had a piece of decadent pecan pie. 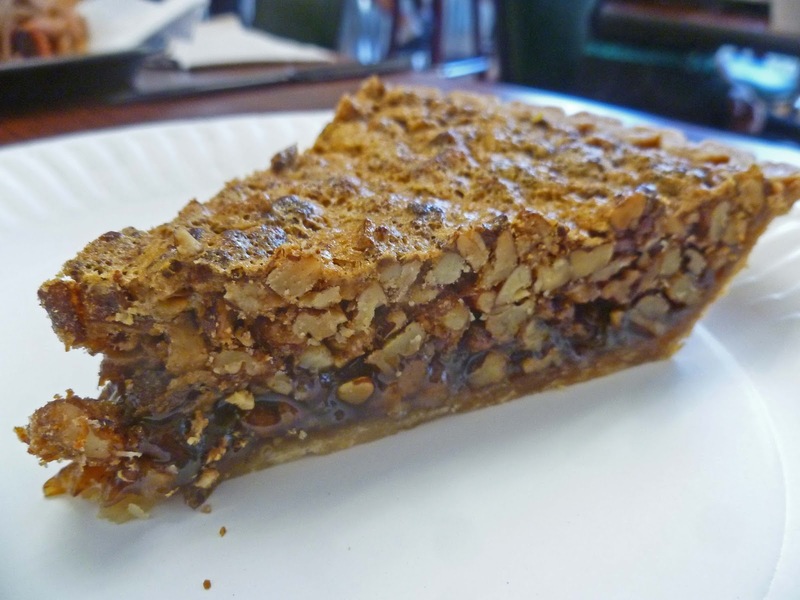 Rich, nutty, sweet and a crust to die for was the verdict for this fabulous pie.. I was not satisfied with just one piece and bought another to bring home. 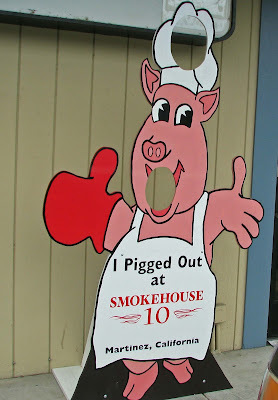 We shall return to Smokehouse 10 because, we have not even tried the pork ribs yet. 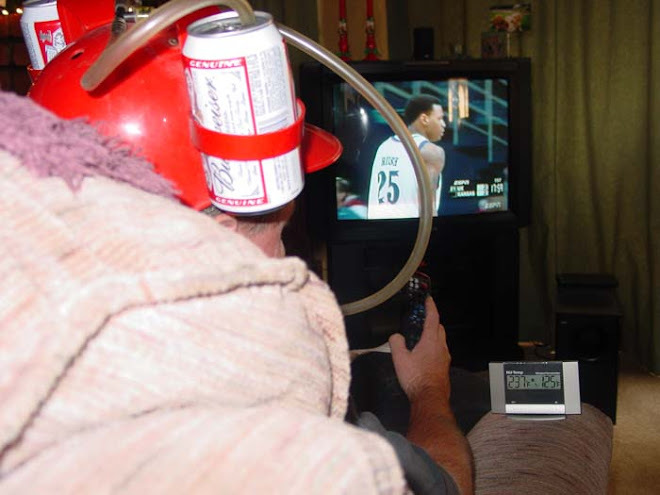 This will be for another day. If you would like to try some competition style bbq, Smokehouse 10 is your destination. 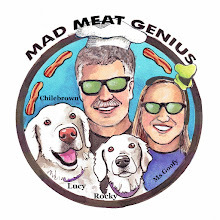 Dave Tendick will be there to guide you through a barbeque journey of great food. He may even share some secrets or at least an autograph. I cannot say enough about the huge meaty beef ribs. What a treat. Three Dogs BBQ, We are lucky because we are only 15 minutes away. 10 minutes when Ms. Goofy drives. Zoomie, I would venture it would be more pleasant to just drive. It is worth it. Ate you saying Mrs. Goofy has a lead foot? OH MY! It all looks so good. The beef rib is ginormus!YUmble. Three Dogs BBQ, Let's just say Ms. Goofy probably could drive Nascar if they allowed potty breaks. Oh man and I going to be in trouble for that. Greg, They are big. What a treat. Chris, They could be an appetizer if you can handle it. You have to save room for the pecan pie.